For many Ontarians living in the Greater Toronto Area, Ontario's "Near North" can feel like true wilderness. It's not until you try to drive to the western Canadian provinces or truly explore this region do you get a sense of how huge a province Ontario is. The Near North region covers a vast area as far east as the Ottawa Valley, encompasses the vast (7630 sq. km/2945 sq. mi.) 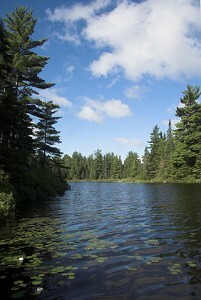 Algonquin Park, and includes the back country near Temagami, which is famous for a huge waterways for canoeing. North Bay on Lake Nipissing is the major urban centre with many interesting museums and festivals. Ontario's Near North accommodations include hotels, motels, resorts, bed and breakfasts and campgrounds. In the middle of the Canadian wilderness, you’ll find delicious peace and quiet. Put your feet up in our log cabins by the lake. Each has a cozy wood-burning fireplace and most have a private deck. Without televisions or radios, the peaceful rooms are equipped with ensuite bathrooms and antique furniture that strikes the perfect balance of unembellished comfort. This cottage resort located at the crossroads of the Haliburton and Muskoka Ontario regions is a perfect choice for a tranquil escape, an energetic holiday, a unique family function or a relaxing destination. Our family oriented atmosphere will provide you an unforgettable resort vacation experience. Enjoy a year round escape in the beautiful Algonquin Highlands. This resort offers a wide selection of activities: hiking, biking, kayaking, canoeing, sailing, badminton and a communal bonfire which is included in your package. This is family based with clean comfortable cabins. Our beachfront is safe for all ages. The resort is set in a beautiful quiet bay full of natural wildlife. Showcasing a hot tub and a private beach area, this Eco-Lodge is located in Algonquin Park. There are lots of activities in the area, such as canoeing and hiking and it also includes a sauna and terrace. The property also has packed lunches. This Algonquin Park Bed and Breakfast has private baths and private decks, roof-top solarium with hot tub, swimming pool, deck BBQ, guest lounge with cozy fireplace. With breakfasts you will rave about and free high-speed WiFi it’s a home away from home. This Algonquin Park lodge features guest rooms with lake views and a fireplace. Complimentary paddleboats, canoes and motorized fishing boats are available for guest use. A seating area with a flat-screen cable TV and sofa bed is featured in the guest rooms. Free toiletries including bathrobes are also included. Free Wi-Fi is available. The lodge offers spa services.